CLAPPER: No, I’m not. I think that’s actually a very disturbing assault on the independence of the Department of Justice and I think when the president, this president or any president tries to use the Department of Justice as kind of a private investigatory body, that’s not good for the country. 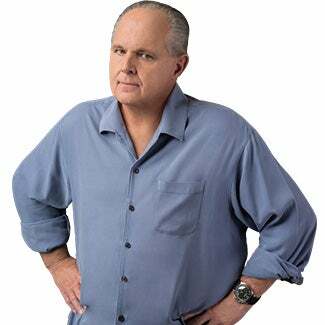 RUSH: That’s just outrageous. It is simply appalling. The president isn’t trying to convert the DOJ into his personal investigatory body. He’s being threatened! He’s being threatened. John Brennan is threatening McConnell and Ryan and, by extension, Trump. These people are the ones that took hold of the entire investigative intelligence agency or operation in this country and turned it against a particular presidential campaign. They implanted spies. They had informants. They spread hoaxes. They lied to a FISA court with a phony opposition research. You know the drill here. And here’s Clapper thinking that we ought not investigate this, “No, I’m not very comfortable with it.” Who cares whether Clapper is comfortable with it. “It’s a very disturbing assault on the independence of the Department of –” What about an assault on the independence of the presidency, Clapper? What about an assault on a specific presidential campaign, which is exactly what this has been. CLAPPER: The big thing here is this is not about spying on his campaign. It’s about what the Russians are doing. Were they attempting to infiltrate the campaign? And that was the concern. CUOMO: Why do it that way? If the concern was the Russians are trying to get to the Trump folk, why not go to them openly? RUSH: I can’t — stop it. He’s lying through his teeth. They were no more concerned about the Trump campaign then they are now. This is an out-and-out lie. “No, we weren’t spying on his campaign. It’s about what the Russians are doing. Were they attempting to infiltrate the campaign?” Well, then why didn’t you have a spy in the Hillary campaign? If the Russians were trying to tamper with the election, and if the Russians were trying to cause Hillary Clinton to lose, then why didn’t you put a spy in her campaign to protect her? Because, after all, that’s what we were told, that the Russians wanted Hillary to lose! These people wanted Hillary to win! So why didn’t they put a spy in her campaign to protect her? Now they try to tell us, “Oh, no. We weren’t spying on the Trump campaign. We were trying to protect the campaign. We were trying to protect the integrity of our elections. It’s a very valuable thing to have a spy in a campaign.” Well, then let’s put a spy in every campaign going forward. And let’s have a permanent special counsel, Mr. Clapper. Let’s hire Mueller and make it his job. His job is to investigate every presidential campaign going forward after every election. Since you people have told us that we can’t trust them anymore. The Russians have tampered. And, remember, what is the real beginning of this? The real beginning of this is when they told us the Russians hacked the Democrat National Committee server and network. They have yet to provide any evidence for that. There has been not a scintilla, not a shred of evidence the Russians did the hacking. There hasn’t been any evidence produced of what they got, if they did hack. “Well, just trust us it was.” Then they plant, a year later, with George Papadopoulos, that the Russians have thousands of Hillary Clinton emails. There hasn’t been any evidence of this produced. But this is the beginning of the investigation. They say it happened in July 2016 when Papadopoulos blabbed while drunk to the Australian ambassador, or that it happened with the Steele dossier, the FISA warrant to spy on Carter Page. But it actually began — and remember, Devin Nunes is asking to see from the DOJ what they have that triggered this whole investigation and he has oversight over it. There is no the Department of Justice in the Constitution, folks. Let me give you a little civics lesson for those of you who may not know this. I don’t mean to be insulting. The entire court system — the districts, the circuits, the locations — created by Congress. There are no U.S. federal courts, district courts, appellate courts and all that specifically spelled out in the Constitution. Congress was left to set that all up. There is no FBI in the Constitution. There is no Department of Justice in the Constitution. Congress established all of that, placed it in the executive branch. The president has authority over the executive branch so he runs the FBI and the DOJ. Congress, because they set it up, has oversight. If Congress wanted to eliminate the FBI tomorrow, they could. We didn’t have an office of national intelligence until after 9/11. After 9/11, George W. Bush and some others asked Congress to create the office of national intelligence where we could take all the intel from the FBI, CIA, combine it into one place and put that in the White House, essentially. Which happened. Congress authorized it. That’s why Clapper was able to get the gig, director, national intelligence. It’s not in the Constitution. So when Devin Nunes, the chairman of a committee in the House on intelligence and an elected representative of the people demands to see what the DOJ has, he’s thoroughly entitled to it. They have been stonewalling. Rod Rosenstein’s been saying, “No, no. We can’t have it. Threatens national security. It might endanger people. You can’t have it.” Nunes has refused to accept that answer and has been striving for it, been trying for it, subpoenas, any number of things. They’ve been stonewalling. Then they leaked out in business about a spy. But, you know, Nunes on TV Sunday said they didn’t tell him the name. And Nunes made a point of telling Maria Bartiromo, we have not sought the name of any spy. That’s not what we want. That’s not what we’ve asked them. We have not asked them to compromise any of their sources. We want to know what it is that started this. We want to see what they have on paper that got this whole Russia collusion investigation going. That’s what the FBI will not produce. That’s what Rosenstein will not produce. That’s what Trump is now demanding be produced. And so Rosenstein today said, “Okay. Okay. We’ll do it. You know what? I’m gonna get an inspector general investigation going on this.” Now, don’t get your hopes up because the IG report coming up is on the FBI Clinton email investigation. That investigation took 15 months. It’s like Dan Rather saying, “Do you know that the documents you’re using are forged?” Dan Rather, “If that’s true, I want to be the one to break that story.” Dan, it’s already broken! “If there were spying on a presidential campaign, we’re gonna get to the bottom of it.” Damn straight we are. That has prompted — who is this? — Matt Gaetz, who is a Republican from Florida, congressman. He was on Bloomberg TV this afternoon saying this is bogus. We don’t need an IG investigation. We need a second independent counsel investigation, not another IG investigation. GAETZ: The problem with the president’s tweet is that he literally directs the Department of Justice to investigate themselves. You are right that we’ve got plenty of investigations where the Justice Department and FBI are investigating themselves. What we need is a second special counsel, someone who can bring an independent look to the very serious allegations that have been brought to bear. If we really had people spying on a rival political campaign and trumping up allegations of foreign collusion that didn’t exist, that would be very serious. And whether you’re a Republican or a Democrat or an Independent or a Whig, you should want to make sure that our institutions are strong enough so that we don’t have this type of spying going on in rival political campaigns in the future, but we need an independent special counsel to look at that, not someone who’s housed in the Department of Justice. RUSH: I agree with that. But how long is that gonna take when we all know what happened here? But government moves at a snail’s pace, when it wants to. It’s another facet, by the way, of the deep state. It moves at a snail’s pace. We’re supposed to think things can’t happen quickly in government. It’s just too important, it’s too massive, it’s too intricate, very few people are qualified to run it, blah, blah, blah.